Hey guys! 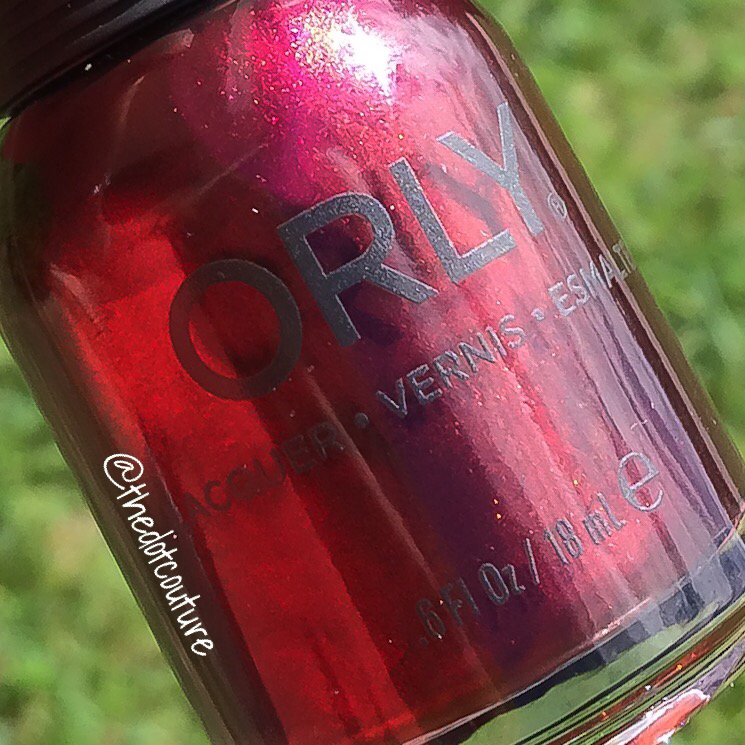 Today I have a quick swatch and review of Orly’s Smolder, an oldie from their 2012 Fired Up Fall collection, although it appears to have been made part of their permanent collection according to Orlybeauty.com. My favourite colours to wear on a daily basis are dark, vampier shades, and my favourite time of the year is Fall/Halloween. So come August my desire for fall-coloured manis goes into hyperdrive!!!!! I stumbled upon Orly Smolder at my local Winners (owned by the same company that owns TJ Maxx and Marshall’s for you U.S. readers). I was immediately drawn to Smolder because it’s red, and I love red. Then I saw the name and immediately thought Flynn Ryder (what can I say, I love Fall AND Disney movies). Smolder is a deep deep red/burgundy with a kind of coppery shimmer and the entire polish almost shifts to black both in the bottle and on the nail. More flashes than shiftsI guess. It’s GOREGOUS. A true ‘lit from within’ polish. And pretty much a one-coater if you are careful with application. You can purchase this at Orlybeauty.com or places like Amazon.com and trust me, the pictures don’t do it justice. If vampy polishes are your thing, I’d suggest giving Smolder a go. It’s definitely a unique vampy red, I didn’t have anything like it in my collection, and am really happy to have it! Let me know what you think! Is this your type of polish? Are you as excited for Fall as I am? < Swatch and Review: Sinful Colors Class Act Demi Mattes – now in Canada! This is a beautiful shade and looks lovely on you! I can’t wait for fall! This polish is stunning. Yes that’s it exactly!!!! They definitely did it right! A+ on everything! Wow, gorgeous swatch. That polish is amazing!